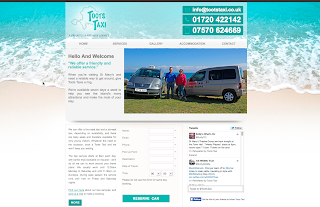 This month we decided we had to blog about the websites of this fantastic pair: Sylina Guesthouse and Toots Taxis. This double-act looks fantastically individual whilst co-ordinating side by side. Not only are they pleasing to the eye, but they are highly functional and have many great features worth talking about. Both Sylina and Toots are run by Sam Mallon and her husband Paul Mallon on St Mary's - one of the Isles of Scilly. They are a major part of the close-knit community on this highly accredited vacation destination. They make the most of working alongside other businesses on the island, using their websites and Social Media to recommend, as well as being recommended themselves and broadcasting tourism news for visitors. When you land on these websites, the first thing you'll notice are the great photos taken by the client of the team that run both Sylina and Toots. They're great fun, beautiful and represent the fantastic atmosphere of St Mary's. As you scroll down the Home Page, you'll come to the live Twitter Feeds, embedded into the Home Pages. Social Media is incredibly important for websites and Sylina and Toots quite rightly make the most of theirs. They are both updated on a daily basis with photos from the island, travel and weather news and generally just friendly comments from the community. 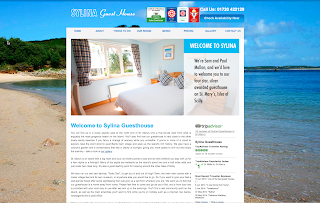 Sylina Guesthouse also uses other third party widgets and accreditations demonstrating that they know their industry well and understand exactly how to represent themselves. You'll notice they are the top B&B in St Mary's and have lots of wonderful testimonials displayed in a custom scroller too. Finally, the booking widget on their Availablilty page is extremely well built and easy to use. With regular updates like these made, these two websites are destined to go down well with Google and other Search Engines as well as get them rated highly on important review-style forum websites. Representing yourself through your website using Social Media and ratings is extremely important but so is making it functional. After drawing lots of business, Sylina and Toots websites are sure to generate lots of enquiries for their services and make this side of communication easy with clear contact details, social media and even a custom, quick reserve form on the Home Page of Toots Taxis. From the start of the build process Sam put in as much work as we did and we are all proud to show you the results. Two websites with the looks, the character, and the functionality needed. Just have a quick browse through their websites and read through their Tweets to get an idea of the strong community on the Isles of Scilly and to see two perfect examples of how a website can be used to help and represent a small, independent business.